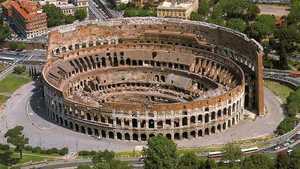 The Colosseum is the largest amphitheater that the Roman Empire has ever built. Larger than the others, higher, it surpasses in size those built in the Roman provinces of the regions of North Africa or those of Eastern Europe. 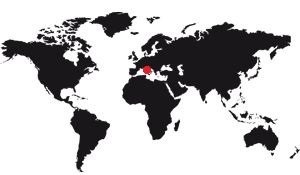 The reason is of course the need to show that Rome, the center of the political power of the Empire, has superior equipment to other cities in the world, even belonging to the Empire. The Colosseum is circular, it's an impression you have when you look at it, but in truth it is ovoid, a scientific word for the shape of an egg. It is actually an ellipse with several centers. This particular form is very accentuated since the ratio between the length and the width is 1,2, that is to say 187,75m long, a width of 155,60 only. Its height, at the highest point, is 50.75m, a height given between the present ground and the highest point of the construction, without the masts which formerly bristled the summit. The amphitheater is composed of a central arena, terraces, and a facade distant from the terraces. Moreover nowadays the stands are complete while the facade is not, which allows to see the structure of the building. The arena is very large, it is 83m long and 48m wide, a ratio of 1.73. So, not only is the Coliseum flattened, but the bleachers accentuate the flattening, making the arena very oval. In fact this ovoid shape is not a Roman specificity: At all times the Romans built their amphitheatres with this form. The facades are composed of 80 arcades on 3 levels. Each arcade at 4.2m width, for a height of 6.45m, except the lower one which have a height of 7.05m. In terms of available space, the dimensions of the Colosseum are impressive: the figures range from 75,000 to 80,000 places, the population of a current medium-sized city. The show days Rome was emptying a bit of its population, which was concentrated here. This is to say the importance of this arena, since everything that was said could be heard by thousands of people at the same time. It should be noted that the hierachisation of ancient Roman society implied a hierarchy in the allocation of the places of the Colosseum: the more important the person, the better his place. For comparison, we can mention the size of some other Roman amphitheatres. That of Leptis Magna, built in 56 AD by Nero, measures 121 x 111m, for an arena of 57 x 47m. He is on the coast of North Africa, in what is now Libya. That of Pompei was built 150 years before, in 80 BC, by Caius Quinctius Valgus and Marcus Porcius, two magistrates of the city. It is one of the oldest permanent Roman amphitheatres, and has a size of 135 x 104m and a 67 x 35m arena. Today we can still see it, it is pretty well preserved. In France the arenas of Nîmes begin to be built in 90 AD, 10 years after those of Rome. They are also large, but are far from them: 133 x 101m, for an arena of 69 x 38m. If you go to Spain today, let's mention the city of Merida which has the ruins of its Roman amphitheater, it was built in 8 BC and measures 126 x 65m. Finally to finish this comparison, the amphitheater of Pula, in Croatia, is 133 x 105m. It is contemporary with the Coliseum, it was built in 79 AD.